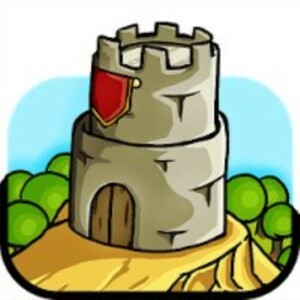 Grow Castle for Android by Raon Games has been one of the more addicting games I've been hooked on in the past week. The game is ingeniously designed to be both addicting and simple to play. The one goal is to protect your castle with city archers, heroes, and other defensive structures. Grow Castle can be easily played without paying money, but it is advertiser supported model via optional videos. If you choose to watch the videos, you'll be awarded more Gold Coins. In my opinion, optional video ads is beneficial to both gamers and developers. Grow Castle has fairly basic graphics, but they work well. All of the units are derived from simple stick figures, dressed up as different units. Gameplay runs fairly smoothly on my Nexus 6P, but at times can lag when gameplay is fast forwarded. There is the option to disable all noise, change graphic level, and save game progress to the cloud. Part of what makes Grow Castle addictive is the simple nature. It's very difficult to lose, unless you're not paying attention. Plus, the game presents your Global rank at the end of ever Wave, which only encourages you to play more to work up the chain. With many updates to the game, I've noticed new features as well as unit damage balancing for a more fair gameplay. The basics are simple to learn, but if you missed some of the instructions, here's a quick overview of what you can expect from Wave 1 to all the various upgrades along the way. Upgrade your Castle with Gold Coins to improve the Hit Points (HP) and Mana Points (MP). For every enemy killed defending your castle, you'll get Gold Coins and Experience Points, which can be used for various upgrades. Arm your castle with up to nine heroes. Choose from the Ogre, Necromancer, Military Band, Priest, Tiny Giant, Spear Slinger, Smith, Voodoo, Bazooka Man, and Barbarian. Each hero can cast spells or summon units from a shared pool of Mana Points. Heroes can be upgraded to increase damage dealt and upgrade special abilities. Upgrade Castle defense by enlisting Town Archers. These units fire arrows from behind the wall. They can be upgraded and don't cost Mana Points to deploy. Tower Archers can be upgraded with Gold Coins. Skill - Upgrade your skills to increase your abilities. There are abilities such as Bonus Gold, Bonus Experience, Cooldown, Damage, Critical Chance, Castle Defense Town Archer's Attack Speed, MP Recovery, Summoned Unit Damage. Skills are upgraded whenever you gain a level. Treasure - You have the option to buy and equip up to 4 of 26 different rings and amulets to further improve skill. Map - A kind of side quest, conquer other villages to get residual payments. For each town, expect between 1000 Gold Coins per minute actively playing the game. Add Shops to your town for further upgrades Inside and Outside of your Castle. Inside Castle Shops - You'll have the option to build Shops inside your Castle as your Castle gets stronger, up to 3 Shops. Choose from Forge, Mana Henge, Archer Guild, Hero Guild, Mine, Tower, Spring Water, and Bar. Outside Castle Shops - You'll have up to 4 shops that can be built as your Castle grows. Choose from Worm ,Tree, Tropy, Flame Tower, Frozen Tower, Lightening Tower, Cannon, Thorn Worm. Enemies attack in waves. Defeat each wave to continue on with the game. There is a seemingly endless number of enemy waves. Waves at lower levels are shorter and easier to win. Each wave slowly takes longer and longer to win. Once you beat a level, you can only replay the current wave or next wave. You can't play an earlier wave. Gameplay can be sped up 2x, which is useful for the later waves that take longer to beat. After playing to the max Level of 181 and Wave 550, I have a few Grow Castle tips to help you win. Also listed my favorite heroes, shops, spells, and treasure! Don't worry about upgrades Gold Coins. You'll have many opportunities to watch videos that are a much faster way to accumulate Gold Coins. I spent a lot of money on many upgrades, but I find upgrades to the Tower Archers are best use of Gold Coins. The problem with upgrading heroes is despite stat improvements, more MP required to cast. To get more MP, you'll need to upgrade your Castle. On the other hand, Tower Archers are always firing. Hero Guild - Hero Damage +30%. Tower - Tower Damage +20%. Bar - Double Summoned Units, Damage -25%. Barbarian/Warrior - Summon Barbarians for X seconds - Effective at stopping enemies before they reach Castle walls. Spear Slingers - Summon Slingers for X seconds - Good to help Barbarians from reaching Tower walls. Hunter - Town Archer attack Speed +X% for X seconds - Because I like upgrading Town Archers, this is a good spell to further increase attack effectiveness. Skull Ring - Summon Unit Damage 50% - Important because I cast many Warriors and Spear Slingers. Ruby - Summon fire Golem Damage 350% of Town Archer - This Golem is always there and does not die or need casting. Thorn Bow - Damage +30%. I've been playing Grow Castle a bit each day for the past few weeks. I commend the developers at Raon Games for creating such an addictive game. If you haven't tried the game yet, I suggest you head over the Google Play Store to download Grow Castle.